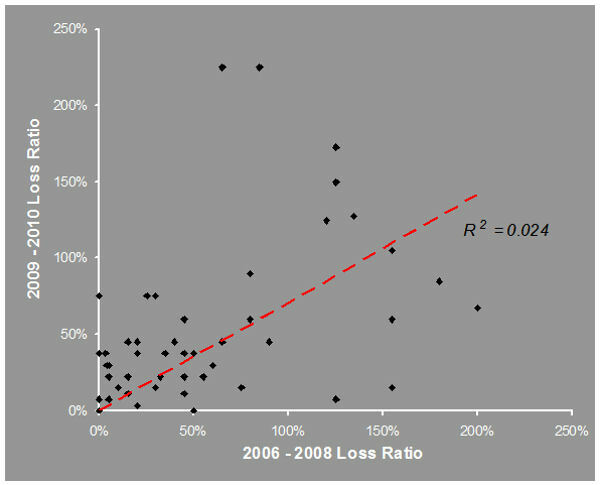 What we have done is to establish a loose correlation between 2006 – 2008 and 2009 – 2010 loss ratios. But I also mentioned a while back that I had fabricated the figures, so how does that work? In the same section, I also said that the figures contained an intentional bias. I didn’t adjust my figures to make the year-on-year comparison work out. However, at the policy level, I was guilty of making the numbers look like the type of results that I have seen with real policies (albeit of a specific type). Hopefully I was reasonably realistic about this. If every policy that was bad in 2006 – 2008 continued in exactly the same vein in 2009 – 2010 (and vice versa) then my good segment would have dropped from an overall loss ratio of 54% to considerably more than 40%. The actual distribution of losses is representative of real Insurance portfolios that I have analysed. It is worth noting that only a small bias towards policies that start bad continuing to be bad is enough for our rule to work and profits to be improved. Close scrutiny of the list of policies will reveal that I intentionally introduced several counter-examples to our rule; good business going bad and vice versa. This is just as it would be in a real book of business.